Nothing can chase away the winter blues better than a dose of Sicily’s arance rosse, the “red oranges” commonly known as blood oranges. And in case you are thinking this means dark red blood oranges, you are only partially right, as Sicily produces 3 varieties of arance rosse that are protected under the PGI certification (Protected Geographical Indication) attributed to a heirloom products from a specific geographic area. In eastern Sicily, this IGP area is roughly south of Catania and north of Syracuse in the fertile area enriched by the Mt. Etna volcano. The sharp difference in temperatures between day and night creates the perfect climate for blood oranges to produce anthocyanins, which are responsible for the red color of the flesh. 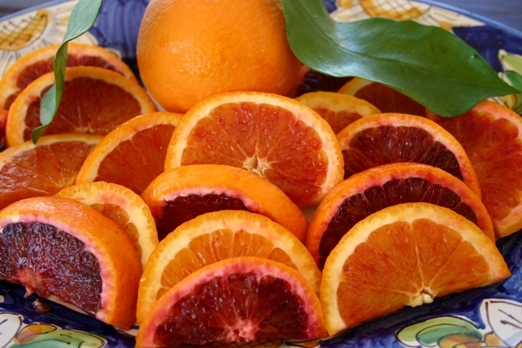 The Moro variety has the dark wine-colored flesh often associated with blood oranges, while the Sanguinello has flesh just lightly streaked with red. Both are often used for juice. In a class by itself is the plump Tarocco orange, packed with 40% more vitamin C than other oranges, with a luscious orange pulp streaked with red. It was discovered near the Sicilian town of Francofonte sometime in the 18th century, and to any Sicilian, tarocco oranges from the Francofonte area are the most highly prized. 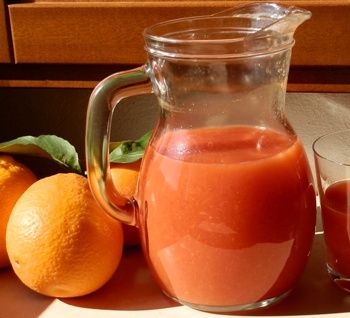 The color of the skin of the tarocco blood orange gives little clue as to what is inside. Sometimes the skin is uniformly orange, or it can be blushed with red, as though embarrassed to reveal its voluptuous flesh. Fragrant and meaty, the flesh has just the right balance of acidity and sweetness, and the red streaks are bursting with the flavor of raspberries. Delicious eaten on its own, the tarocco orange is also excellent paired with fennel, or it can nonchalantly hold its own in a pungent Sicilian salad of onions and black olives, something a standard navel orange couldn’t dream of doing. In other words, it’s the perfect orange. 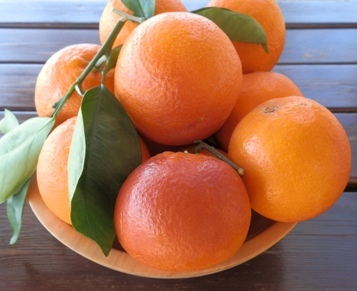 An Italian proverb declares : “Le arance sono oro al mattino, argento a mezzogiorno e piombo la sera” – Oranges are gold in the morning, silver at noon, and lead in the evening, proving that not only are Italians obsessed with their digestion, they haven’t been eating tarocco oranges after dinner as I have been. Maybe I have an iron stomach, but every night I sleep soundly with no leaden sensation, dreaming of my oro al mattino. Anita; oh how I envy you being able to eat this glorious fruit straight from the tree. I live in Ireland and for the first time, this week, found blood oranges in my local shop. I too found the taste/colour connection with raspberries!! I have a series of paintings of citrus fruit,some of which are blood oranges – ‘Sanguinello’; ‘Morro’; and ‘Tarocco’. I live here in the USA, & would like to know is it possible to buy blood orange tree her in the USA ? Hello John, I think it is best to consult a local nursery for a blood orange tree – if they don’t have one they should be able to order one. And make sure you have the right growing conditions, the temperature difference btween day and night is essential. You need cool nights, which is why they don’t grow in Florida. Happy gardening! Are these oranges permitted in the US? Do you sell to any markets in New York or Philadelphia? 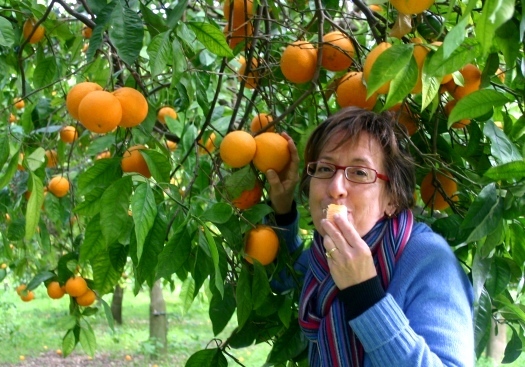 So glad to hear that you share my passion for Tarocco oranges, and that you tasted fresh red orange juice in Sicily!